The Momentum oscillator shows the speed/acceleration (or rate of change) of price action. This study is often used to indicate overbuying and overselling. A positive reading indicates overbuying and a negative reading indicates overselling. Traders will also use the Momentum oscillator to look for divergences against price action to signify possible reversals. A bullish signal is generated when the indicator bottoms and turns up. A bearish signal is generated when the indicator peaks and turns down. The signals provided by Momentum oscillator, are typically the most meaningful when the price and volume of the chart being analyzed have also set up a bullish or bearish pattern. Some traders may use the Momentum oscillator as a leading indicator. For example, let's assume that price action is identified as being very bullish; the Momentum oscillator will climb sharply too. But when it diverges from price action expect a sentiment change in price action. 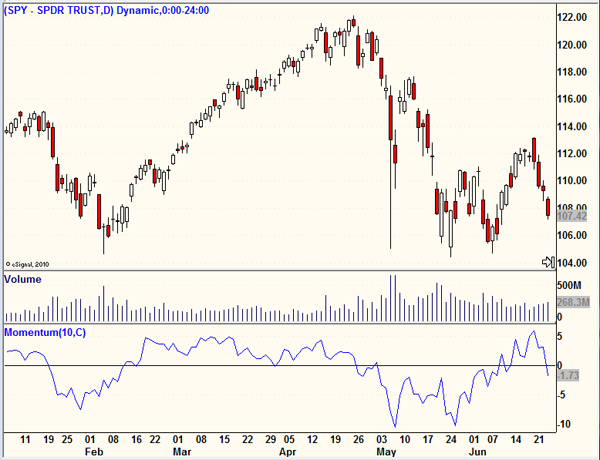 Similarly, when price action is bearish, the Momentum oscillator should be dropping too. Look for a divergence (upward push) in the Momentum oscillator to indicate a trend reversal. Using the Momentum Oscillator for additional confirmation of what has already been "read" in the chart can be a powerful addition to the assessment tools used by a technical analyst.